TheArmenianKitchen.com : Americans call it okra, we call it Bamiya. I call it delicious. My wife thinks I'm nuts. Americans call it okra, we call it Bamiya. I call it delicious. My wife thinks I'm nuts. Okra was frequent fare at our house when I was growing up, and I loved it. I’ve since learned that I have a lot of company in many places, including the American South and pretty much the entire Near and Middle East. Armenians, Greeks, Persians, Turks and Arabs all favor similar preparations and have similar names for the tomato-and-okra stew we call bamiya. A notable exception to okra’s fan base is my wife. “It’s too slimy,” she says. I discovered early in our courtship that there was no point arguing. The most enthusiastic reaction I’ve ever gotten is, “I guess it’s OK for what it is.” It’s not hard to figure what she means, as she’s never taken a second bite. We rarely bother cooking anything we won’t share, so okra has become a distant memory for me—but definitely a fond one. When I think about the rich tomato-and-okra stew we call bamiya, I picture myself running into my parents’ house on a cold winter evening and sliding my chair up to the kitchen table. Nothing could possibly be as warming or comforting as a hot ladle of bamiya poured over a mound of Mom’s pilaf and sopped up by a fat slice of fresh, crunchy bread. We don’t have much use for winter warm-ups of any sort here in Florida, but this all came back to me in April on a chilly day in London, England. Robyn and I took an unplanned cruise across the Atlantic and booked a few days in a London hotel as a fun finale. Just my rotten luck, I came down with the flu before the ship docked at our next-to-last port in France. By the time we reached Southampton, my fever spiked at 102. I don’t remember much about the two-hour ride to London, where I spent the first two days of our three-day visit in bed. With plenty of time on my hands, I did a bit of Yelping to see what we were missing in the neighborhood. 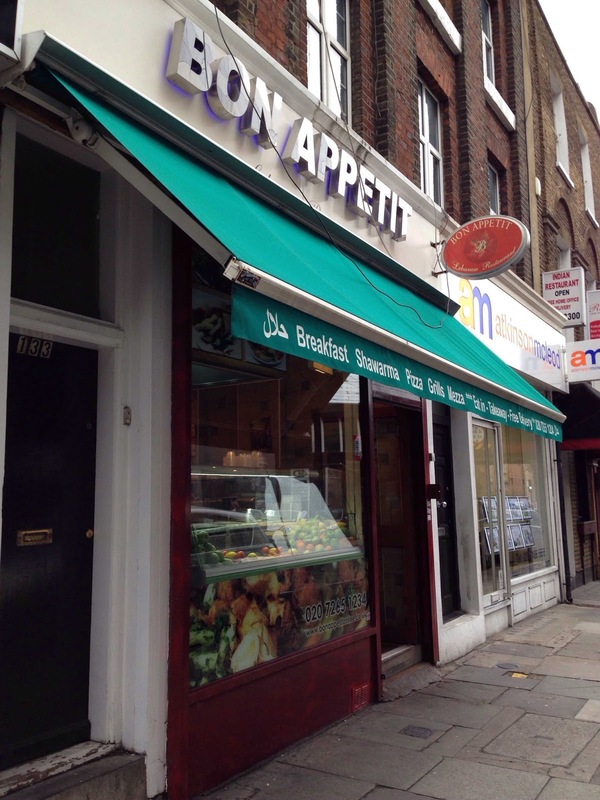 That’s when I spotted the Bon Appetit Lebanese Restaurant just over a block away. What little I’d eaten of the hotel food was OK, but we decided something a little closer to home cooking might boost my appetite as well as my spirits. So I got dressed, bundled up and trudged down the street. The restaurant was little more than a take-out counter, but it did have a few tables in a sparse but neat back room. 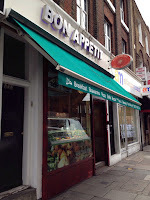 The friendly young man in charge assured us that everything was made from his grandmother’s recipes. “It’s what we eat at home,” he said. I not only ordered it, I ate every bit with a smile. No, it wasn’t just like Mom’s and it didn’t cure the flu but it sure beat fish and chips! Two weeks after returning home, we were shopping at a nearby Persian market when Robyn spotted a display of fresh okra. “Treat yourself,” she said, so I did. We bought just enough for one, and I was definitely the one. My big bowl of bamiya had me smiling again. 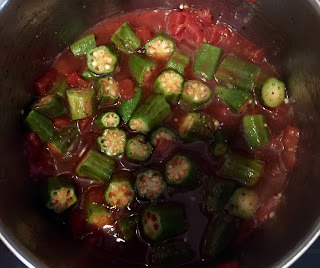 Before I share our simple recipe, I want to offer a few further thoughts on okra. Many cooks who share Robyn’s aversion to slime swear that soaking okra in vinegar reduces or eliminates the problem. I don’t much care for sour okra, so I don’t bother. Others recommend cooking the okra whole, or at least in large pieces. I disagree. I find the key to reducing slime is simply to avoid overcooking, and it helps to keep the pieces small. Okra gets slippery when it breaks down, but it’s delightfully crisp when cooked until it’s just tender. It’s essential to choose young, fresh okra. Older, bigger pods tend to be tougher and can be so fibrous you can’t chew them no matter how long they’re cooked. One half pound fresh okra, the smaller in size, the better! Wash and dry the okra, then slice the large end from each pod just below the stem. Cut into half-inch pieces and set aside. Slice the onion and saute in olive oil until lightly browned. Add the tomato and its liquid. Season to taste, then simmer with lid on for 12-14 minutes. Check a piece of okra for desired tenderness and cook as desired. You can use different seasonings if you like. Many like allspice, some prefer za'atar. Meat is optional, lamb being preferred. It will take much longer to cook than the okra, so cook the lamb first and add it to the bamiya when ready. I came to like okra in my old age. I used to hated it for its sliminess until I found the secret. Slit the pod down the middle and fry the slime out of it. Then you can add tomatoes or whatever and you're pretty safe. It helps to have young pods and not to overcook, as you mentioned. Brilliant suggestion, Ara! Even I am willing to give this method a try. Thanks! Great article, reading it I could almost taste this dish. I've only had okra a few times, in restaurants; it doesn't show up on the table at home. But although I know what you mean by "slime" I want to put in a word for those of us who don't object to that texture. There ought to e a nicer word for it. Sorry, Dave, there isn't a nicer word for slime. Here are a few synonyms, however: gelled waste, goo, gunk, sludge. Get the idea? Doug I'm with Robyn on this one. Mom made it for dad because he loved it so much but my brother and I despised the slime. Now that I live in the South and am married to an Odar I love southern style fried okra. I don't mind fried or pickled okra, but when it's cooked in a sauce, that's where I draw the line! My grandmother's secret, passed to me by my mother. Cook the meat, tomatoes and onions, etc. together-everything but the okra. Then layer the meat mixture with the uncooked or still frozen whole whole okra in several layers and simmer gently. DO NOT STIR!. That breaks down the pods and causes the gooey mess. Ladle it out over the pilaf at the last minute, when ready to eat. Thank you for sharing your grandmother's secret method!